Copper Moon Apothecary is dedicated to the wisdom of traditional healers and the use, formulation and application of herbs and other pure botanicals for the purpose of healing. The last decade has exploded with the reemergence of herbal healing and scientific studies validating what ancient practitioners have been passing on for thousands of years. 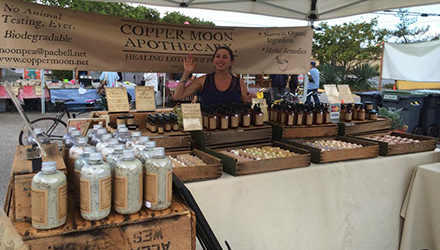 Copper Moon Apothecary has formulated healing lotions and potions as well as salves, balms and bar soaps. While all formulations are intended to heal externally, many are deliciously pampering and soothing to the soul and senses. All of the Apothecary's products are made with healing intent in small batches to ensure the quality and the integrity of the pure ingredients used. The Apothecary uses only certified organic herbs grown in the Apothecary garden, wild crafted or purchased from reputable sources when fresh herbs are seasonably unavailable. Our rich emollient oils and butters are fair trade, organic, unrefined and sustainably harvested. Copper Moon Apothecary is dedicated to supporting local, organic growers and farmers dedicated to the support of healthy ecosystems and respect for the earth, and positively no animal testing.